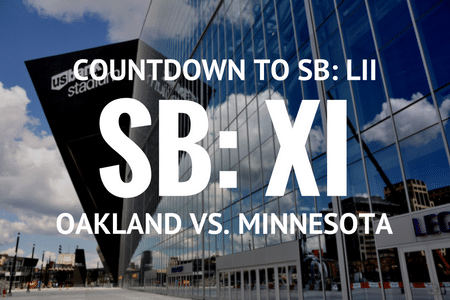 Super Bowl XI would go on to be remembered as one of the greater offensive Super Bowls in the early years, as the Oakland Raiders racked up an NFL-record 288 yards of offense in the first half of the game. This would help the Raiders get out to an early lead, eventually leading them to a 32-14 victory over the Vikings. Over 103,000 fans were in attendance for Super Bowl XI, making this one of the most heavily attended Super Bowls to date. While Raiders cornerback Willie Brown had a stellar showing, recording a 75-yard interception return for a touchdown, it was wide receiver Fred Biletnikoff that was awarded the Super Bowl XI MVP trophy, with four catches for 79 yards in the big game. By Super Bowl XI, the halftime show had transitioned to becoming more of a performance instead of it being marching bands. Disney presented the “It’s A Small World” production with the Los Angeles Unified All-City Band for halftime of this Super Bowl. Another interesting fact about Super Bowl XI remains that the national anthem was not sung, but instead, singer Vikki Carr performed “America the Beautiful” before kickoff.